Are PowerCoil wire thread inserts DFARS compliant? A: Yes, the raw materials used in the manufacture of PowerCoil wire thread inserts originate in qualifying countries. Are PowerCoil inserts available to MIL-spec or MS-MA equivalent? A: If ordered per MS/MA part number, certifications are available. For inspection purposes how do you measure an insert before installation? A: An insert in its free state must be measured by counting the number of coils from the notch of the tang to the top of the insert. The number of coils per a specific size insert can be found in the PowerCoil Wire Insert Tech Data.xls file on this website. Can you use a standard drill/tap combination with PowerCoil inserts? A: No, as with other wire thread insert systems, STI (screw thread insert) taps must be used, and we advise following drill size recommendations shown on our kit labels and the Tech Data shown on this website. Why are there not drills in all repair kits? A: Drills are available in all kits up to ½” UNC/UNF and M12 where usage is most prominent. Drills are not included in the larger sizes, as they are standard sizes, and in order to keep kit costs affordable and kit size efficient. Is installation tooling other than what is shown in the repair kits available? A: Yes, prewinder and threaded mandrel tooling is available as well as pneumatic tooling. Are PowerCoil wire thread inserts interchangeable with other brands? What are PowerCoil screw-lock inserts, and why are they dyed red? A: Screw-lock inserts are used in applications where there may be vibration, allowing the mating fastener (screw) to loosen. The screw-lock insert ‘locks’ the mating fastener into place where a certain amount of torque is required to release the fastener. This eliminates the need for a lock washer. Screw-lock inserts are dyed red for identification purposes only. Please note that metric screw-lock inserts may not be dyed red per applicable standards. If there are problems installing PowerCoil wire thread inserts, what should be checked? A: A wire insert simply follows the tapped threads when being installed. If you are having difficulties installing the insert, first check to ensure that you have the correct STI tap and drill size, and check them for wear. Many end-users will gauge the tapped hole to be sure it is within tolerance. If the insert installs correctly, but there is difficulty in winding in the mating fastener, first check the fastener to ensure you have the correct diameter and pitch. You can check the pitch easily by mating the threads with the tap threads. Next, check the drill and tap for wear as this problem could signal that the tapped hole is not in tolerance. 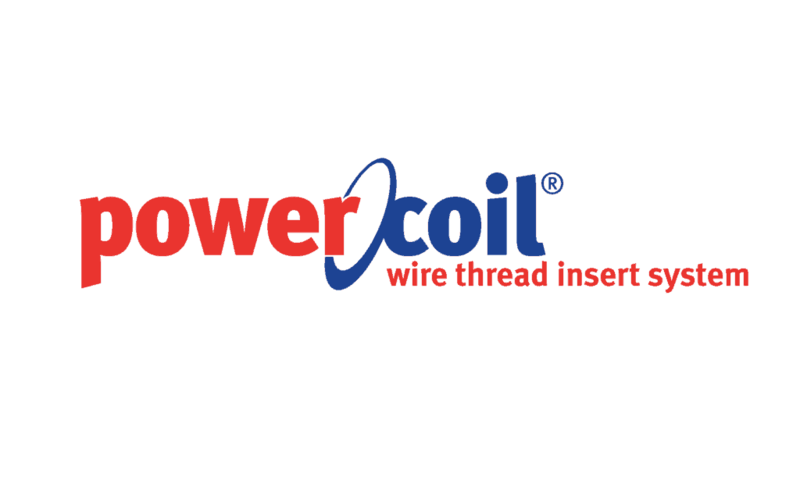 What is the difference between PowerCoil and ProThread? A: PowerCoil is for industrial use and covers a full range of diameters and pitch. All STI taps included in PowerCoil kits are HSS. ProThread is suited to the automotive aftermarket, and covers only a limited range of diameters and pitch. Drills are not included in ProThread kits and STI taps are carbon steel. For reference a carbon steel tap has 1/10 the life of an HSS tap. Why use PowerCoil instead of Loksert? A: First of all, cost is a factor. Secondly, using a PowerCoil insert allows for a thread to be repaired maintaining the integrity of the original assembly, meaning that no additional material is being removed from the parent material. When using a Loksert, additional material must be drilled out of the parent material to allow for the external threads of the Loksert’s outer wall. In a situation where boss is critical, only a wire insert can be used. If there is a size not shown, is it available? A: Yes, specials are available.